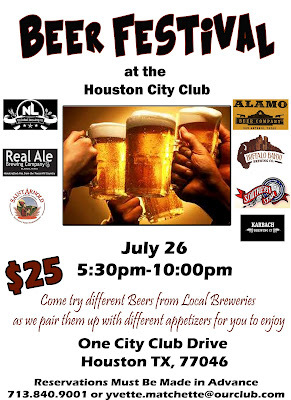 The Houston City Club in conjunction with BeerLovers.com is hosting a beer festival and food pairing event on Thursday, July 26th from 5:30pm to 10:00pm. 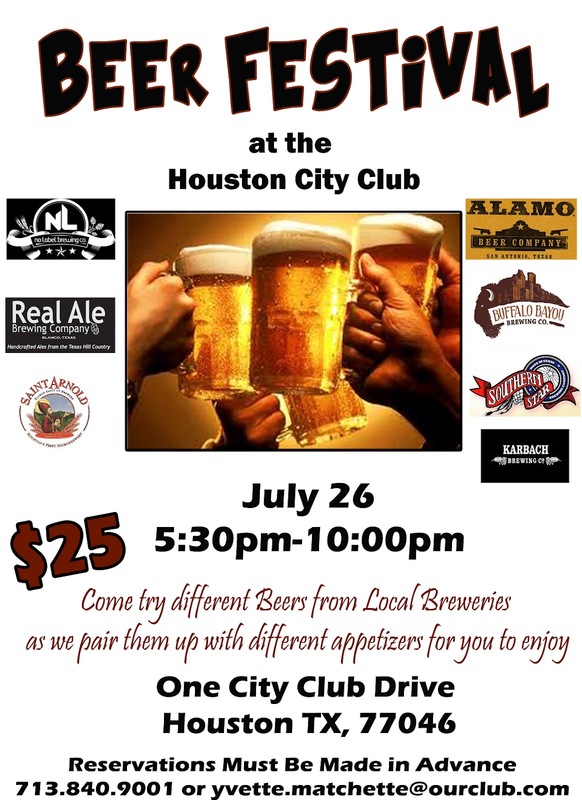 Representatives from local Texas breweries will be on hand to answer questions and talk about their beer and the Club's Executive Chef will be preparing bite-sized food items paired specifically for the beer being served. There will be a speaking lineup as well including Brock Wagner from Saint Arnold, Ronnie Crocker from the Houston Chronicle and author of Houston Beer: A Heady History of Brewing in the Bayou City, and also representatives from several of the new Houston breweries such as Fort Bend, City Acre, and Town In City. There's also some great door prizes such as beer gift baskets, private brewery tours, a "design-a-beer" opportunity offered by Bufffalo Bayou and the Club is offering a trip to Barton Creek in Austin. The event is open to the public but you must RSVP due to limited space (call 713-840-9001 or email Yvette.Matchette@ourclub.com).